NEW YORK (October 4, 2017) – The United Bid Committee announced today the 32 cities across North America that could serve as Official Host Cities for the 2026 FIFA World Cup™. The 32 potential host cities include four cities in Canada, three in Mexico and 25 cities in the United States. The full list of cities is included below. 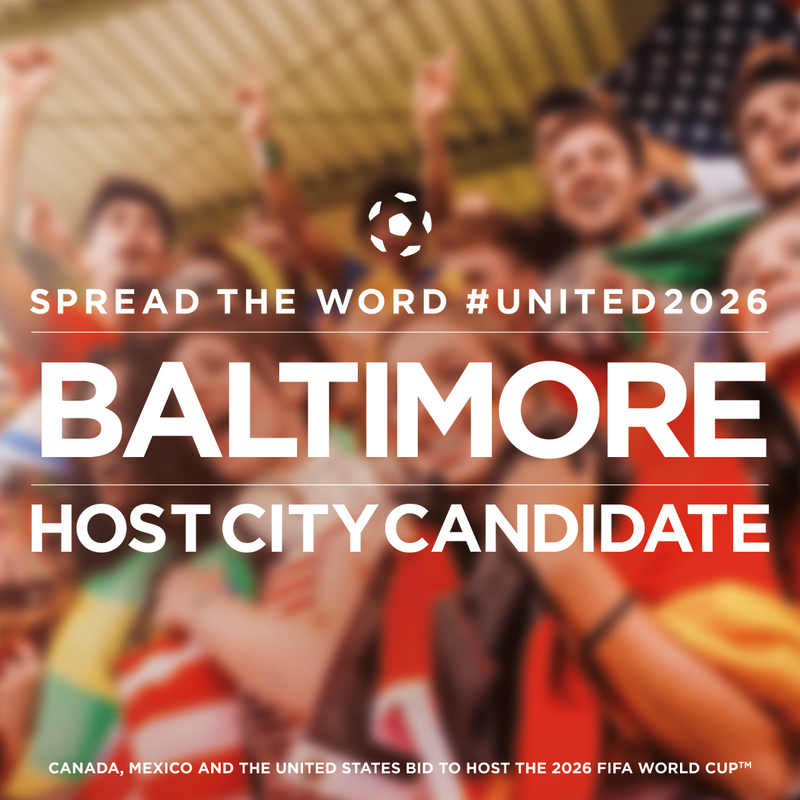 The United Bid Committee also confirmed it will continue engaging with non-host cities in the further development of the united hosting concept. Maryland's Lt. Governor Boyd Rutherford, stated, “Today’s announcement is great news for Baltimore and Maryland, for M&T Bank Stadium, and for soccer fans across the region, like myself. Governor Hogan and I would like to thank the hardworking team at the Maryland Stadium Authority and Maryland Sports Commission, as well as and our strategic partners in Baltimore and throughout the region, for their efforts to showcase our world-class, Stateowned venue and remarkable destination. We look forward to the next phase of the process and our expanded relationship with the United Bid Committee." The Official Host City selection process takes into account various factors such as city profile, stadium and support facilities (training sites, hotels) and services (e.g., transportation). The United Bid Committee also looked at ways each city could contribute to a united hosting strategy for the 2026 FIFA World Cup™ including their contribution to the sport's development and the United Bid’s vision – not only during the tournament, but in the eight-year build up and the social, economic, and environmental legacy. Each of the 32 potential host cities features existing or already planned stadiums and other world-class infrastructure, meeting or exceeding the requirements outlined by FIFA. Additionally, the potential host cities reflect the vast geographic and cultural diversity of North America and share a commitment to using the once-in-a generation opportunity of hosting the FIFA World Cup™ to welcome, entertain, inspire and empower the next generation of players and fans as never before. Maryland Sports, the Sports Commission for the State of Maryland, enhances Maryland's economy, image and quality of life through the attraction, retention and development of regional, national and international sporting events. The Maryland Stadium Authority's missions is to plan, finance, build and manage sports and entertainment facilities in Maryland; to provide enjoyment, enrichment, education and business opportunities for citizens; and to develop partnerships with local governments, universities, private enterprise and the community.